Francie Nolan learns early the meaning of hunger and the value of a penny. She is romantic and hungry for beauty, like her father. She is also deeply practical and in constant need of truth, like her mother. And like the Tree of Heaven that grows out of cement or through cellar gratings, Francie struggles against all odds to survive and thrive. Time for our October book. Click on the link to read an excerpt. You are on the ball, Bonnie, the first day of the month! I checked this one out last month from the library and tried to read it, but just couldn't get interested, sorry. Just wanted to let you know I will opt out this month and next, but I already have the December book in hand. Thanks for all you do! Still dont have a place to live yet but I am on my way to the San Diego library to get me a card. I really loved this book as a kid. 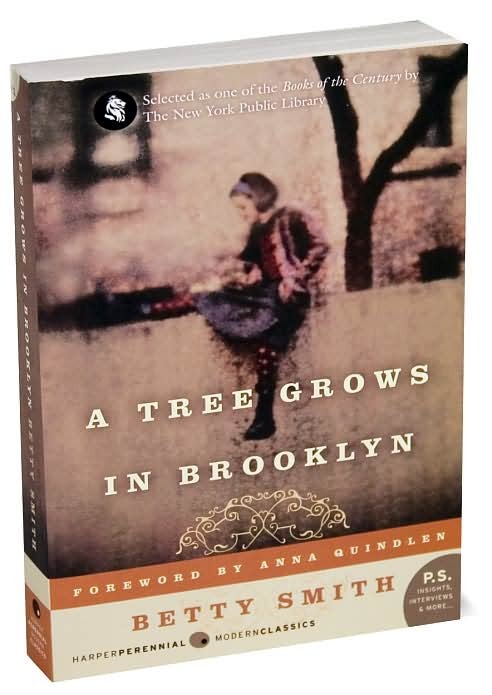 I read A Tree Grows in Brooklyn in 2007. I couldn't believe I'd not yet it before then! My review is here. Hi Marylyn, it was good to see you again when you were in town recently. I met Susan three years ago, but I met Marylyn face to face about 2006. Both of them are from Georgia. If any other Book Buddies ever pass through Chattanooga, let me know and I'll meet you for lunch or tea or something. I've gotten a good start on the book. Reading it brings back lots of good memories. Parts of it I remember from my first read of it when I was in high school. Other parts of it I don't remember. It is surprising how the people and their actions don't seem dated over the years.